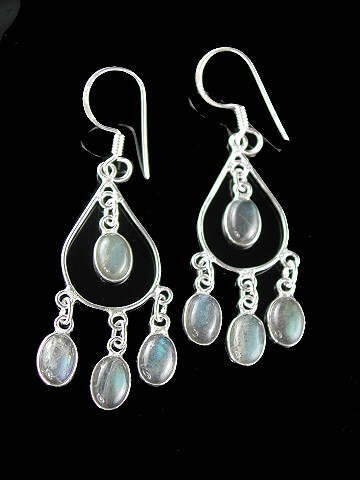 Very pretty Labradorite 'chandelier' style earrings featuring five top quality, blue fire cabochons. Labradorite is a highly metaphysical stone and bringer of light. It facilitates connection and communication with the angelic realm and deflects unwanted energies from the aura. It calms the over-active mind and is an excellent stone to wear through times of change and upheaval. It can clear, balance and protect the aura and has been called the Stone of Transformation. Its properties are as deep as its colourful flashes. A super Third Eye or Brow Chakra stone. From the Feldspar group of minerals, it takes its name from where it was first discovered, Labrador in Canada. It is also known as Spectrolite. On first inspection, if viewed from the wrong angle, Labradorite can appear dull, grey and lifeless. Turn it gently in your hand and it springs to life with the mineral kingdom equivalent of a firework display, exhibiting a range of fiery, intense flashes, from the typical blues and violets through more unusual greens, yellows and oranges.